Today is my birthday! Could I get some trivia on the set I played, Khans of Tarkir? Khans of Tarkir started in exploratory design as a film noir set. Before exploratory design was done, creative got involved and it became Sarkhan’s homeworld of warring clans. I think morph makes slightly more sense as to where it came from then, sorta a detective not knowing the true identity of random people pretending to be regular civilians thing? Yeah, Shawn and I were definitely thinking along the lines of Terry Gilliam's Brazil while we were working on early Tarkir block exploratory design. This was when morph and manifest were the only things we knew about the block mechanically. I could imagine some slight tweaks resulting with a mystery story line with political factions. Abzan - Clergy class with Outlast called "Meditate"
Jeskai - Academic class with physical Prowess thought of as more mental "Acumen"
Temur - Working class aren't so much Ferocious as "Sturdy"
Mark, as today I'm finally turning 20, could you give me some trivia on my favorite card, Squee, Goblin Nabob? When I designed Squee, Goblin Nabob, the mechanic was meant to reflect that he was extremely lucky and thus hard to kill. The card led the story people to make him unkillable. Can I get some trivia on Tarkir for my birthday? There was an early version of the story where Sarkhan goes back in time to kill Ugin rather than save him. THAT would have been spicy. I like how the idea feels both infuriatingly unjust (like, “why should it be THEIR responsibility? !”) and also, in a way, painfully noble. I think I would tweak some things about the idea before applying it directly to the real world (like maybe you should start by selecting a banesaint from whose acts you have somehow benefited, for example). But I keep thinking about it in relation to the real world, and I think it’s an intriguing little nugget of worldbuilding, so here. YOU think about it now. 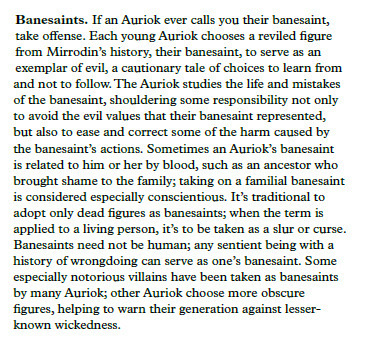 I like this idea of Banesaints. It's sort of like having a patron sinner, rather than a patron saint. That would have been really cool to implement into Ixalan's vampires if they weren't so dang evil. Like, Mavren Fein having a banesaint who caused some nasty shipwreck for some sojourners to the continent. Hey MaRo, it's my birthday. Can I get some trivia on my favorite creature type, Myr? The Myr were originally Gnones. Brady Dommermuth made the Myr to replace them because he hated artifact Gnomes. Thanks Brady, you did good. He did a really good. Yeah, Jace's origin story stayed entirely within the lines set down in Agents of Artifice. I'm not interested in discussing the topic in question again, I'm just posting this here to document that Creative isn't even above outright lying about Magic Origins. Kelly is my favourite writer on the team, for whatever little that might still be worth (and probably a cool guy most of the time), but a lie is a lie. Respond (or not) as you will. Yeah I think you are misunderstanding what she said. By all rights, it really isn't a lie, but there's some bending of the spirit regarding some of which was unspoken. But I'm honestly just playing devil's advocate regarding this. I've got no dog in this particular fight. I'm curious to hear why the people who are saying it isn't a lie think so. I mean, come on, we know there were hard retcons to Jace's origin story in AoA that contradicted not only the spirit but the letter, too. How is saying that Magic Origins "stayed entirely within the lines set down in Agents of Artifice" not a lie? Take the fact that Jace originally didn't have all memory of his former life erased, to mention just the most blatant retcon. They're currently making this even worse in Ixalan block by shining all the spotlight on his supposed amnesia and pretending that he's a character he simply isn't and never was.